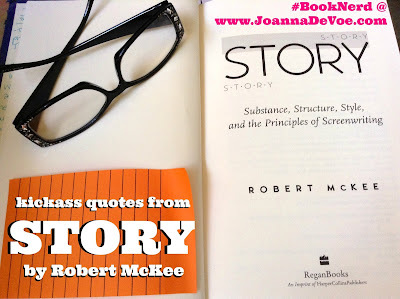 Using the principles presented in Story by Robert McKee has helped me do all of the above in a manner I find endlessly engaging. For me, it's all about the way structure sets you free and how character under pressure is revealing. There are people who say that they write by the seat of their pants and that this book is too focused on plot, whereas they are more interested in character development. Whenever someone says that to me, I silently question whether or not they've actually read the book or tried any of the techniques it outlines. This book will show you how careful plotting sets up tension in a way that forces characters to make choices that expose what it is they truly value and who they are beneath the surface. They're not just hanging out, moving from whim to whim, and trying to drum up emotion where there is none. They're acting and reacting and struggling to keep up with the demands of true cause and effect, which is what a life that is fully lived will do for you, as well. Love the idea of creating a (magickal) life through the art of story. Infact, a favourite book of mine, written by Donald Miller, goes into this subject big time. Another book I love is Tristine Rainer´s " Life as story". This woman also wrote the legendary "the new diary" and although I might never be a writer, you should see the stack of journal/diaries laying around here at my place! Deep down It feels good to know that words on paper can change peoples lives. And the same for blogposts! Thanks again for sharing! THANK YOU so much, Charlotte! Love the book recommendations, too! For 6 weeks feeling stumped over rewriting the ending of my 175,000 word novel I've worked on for 3 ½ years because my freelance editor I hired almost a year ago doesn't like my “open ending”. Feeling distraught after so many weeks I listened to a Steven King/Lee Childs interview then stumbled upon your fine video about “Story” and more. I didn't want so many YT viewers to see this so I came here. I only paid her to be a Beta Reader, but she all totally on her own accord went way beyond and wrote a detailed outline of the first four chapters, and now an outline of all 14 of the original chapters to my novel! It has expanded from about 113,000 words to 175,000, yet I do feel my story is much better. I'm wondering in general what you think about endings. I couldn't afford to pay her more, yet she still kept writing outlines and detail margin notes on all 14 original chapters. I gave her a $100 bonus over the initial $175 beta reader fee, but that's all I could do with her first read as I live in a sliding scale fee apt, ride bike, and take city bus. She kept saying she didn't need any bonus and now as of about 6 weeks ago started reading my latest draft again for $175, but now that's it, all I can afford. I haven't heard from her as she tends to disappear and not answer my emails. So I don't know her reaction to my latest draft writing as about 6 weeks ago I gave her 75% of it all but Act 3. Hemingway had two novels and several highly acclaimed short stories with open endings. In the movie world “Hildalgo” https://www.youtube.com/watch?v=urnjRUVYRY8 had an open ending and worked. I don't know why I'm typing all of this, and sorry it's so long. It's just I feel sometimes like something inside of me is dying over this ending and trying to change it from the way it had gravitated from my soul. I'll see parts where she missed things here and there with such large time gaps between her reading and doing other projects. Now is another example as I gave her one chapter in Act 3 about 2 weeks or more ago and no response, plus she's had for 6 weeks 75% of the story and no response. What do you think about open endings? I don't complain as it is very nice she is doing more than Beta Reading even though that's all I can afford to hire her for. Am I violating some cardinal major rule with an open ending? I'm going back to "Story" again to see too, but just wonder what you think as you speak with such authority. Thanks for your video! Hi Winfred... It looks like you've written something this reader finds extremely compelling- so much so- she wants to have a hand in shaping it. Perhaps she's a frustrated writer herself? It's lovely that she's helping you, but ultimately it's your story. If you LOVE it the way it is, it stands to reason that others may too... Stand strong in the ending you believe in. We'd all go crazy if we changed our books every time someone thought they knew how to do it better- a quality that writers seem to bring out in other people. I suppose that's why writing takes a great deal of courage. And no- you are NOT violating any cardinal rules. Keep keeping on- and trust your instincts.